Gone are the quiet Mondays! The Booking Office was kept busy with a continual stream of booking enquiries today and even secured another driver experience booking as well, amongst other general administration. Tony Watt ably hosted a testing customer who arrived very early. The VCT were a little depleted so they did some housekeeping tasks instead. Down the yard, the LMSCA were taking advantage of the excellent weather to continue their major bodywork quest on Brake Third 27001. Reports from the deep south suggest that several bags of brash at Duffield have been filled and some fencing has been treated to improve the look. Not too bad for a Monday as we head towards peak season with Tuesday and Thursday operating this week. A rather average day of odd showers, cloud and bits of sunshine nevertheless saw us quite busy with our usual Sunday selection of passengers and lunch guests plus the best part of over 120 Brownies. Around the station Hulland Ward Parish Council mowed the wideway, and the staff at Duffield took steps to keep the weeds under control. same colour as a pair of Victorian bloomers and the LMSCA painted their struts green, as well as undertaking a great deal of welding on the BTO. 51188, and addressed an oil and fuel leak on 51073 between trains, amongst many other activities. A steady but quiet day on our railway today, the weather being slightly chilly for the end of June. The DMU's ran on the scheduled services without undue delay except for sheep on the line at Hazlewood plus a defective headlamp bulb. Our Drivers Apprentice and his guest enjoyed their experiences which included some sump checking and starter button pushing. The conscript of the day mowed the picnic area and made a neat job. A First Aid course was run by John Ball and Julie looked after the Model Railway, also an Induction Course was run by Anton for the benefit of the new recruits. There was a steady flow of visitors to the Pullman Buffet and the bookshop.The LMSCA were making progress with the body end on the LMS BTK vehicle.The 8F Group were found to be machining parts for the main spring hangers and sorting and bedding the axle box bearings on the "Duke". A very much depleted DMU Group being Joe with myself as the audience managed the greasing and oiling on 50170, Throttle EP Valve on 55006 and fuel for 51188.The rest of the group were sunning themselves at Barry Island South Wales examining two potential DMU vehicles. Fred and Iris examined the station flower pots and did some strategic watering. A good and steady day really. A slightly damp Friday saw us handling a number of Drive a Diesel guests including some of our friends from Trent Barton. Down the yard, the DMU team sorted their way through assorted DMU challenges, and the LMSCA carried on with the rebuild of the south end of their LMS Brake Third Open (BTO). whose main pastime appeared to be a determined attempt to keep the phone ringing at five minute intervals from dawn to sunset in order to prevent the staff sitting on the new chair. Meanwhile, the Station Foreman effected a multi-million pound repair to the front of the Booking Hall, involving some 3 ply, bathroom sealant and a tin of primer. Similar efforts were taking place at Duffield involving our picnic tables. Again Shottle was the main show in town with a good turn out from different departments to spread and "wacker" the stone down to the level required by the tarmac layers. Today's photo shows some of the team as the project moves ever forward. Any help next Tuesday, Wednesday and Thursday will be made very welcome. 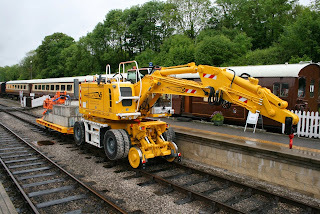 At Wirksworth dmus were washed, following the observations by the LCC, and the gear box for 50170 hoisted into position. The dmu team also dealt with flat batteries on 33035 so that it will be fit to run tomorrow for our Drive a Diesel Day clients. The Pullman Buffet Car enjoyed the custom of today's visitors and staff and the Booking Hall continued to serve our Amazon and other customers. Without doubt today's story is all about Shottle. 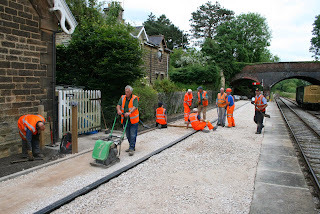 The SBT and PWT joined forces to erect the first ever full sized semaphore signal to be seen on our Railway and the first of the stone fill for the platform was "wackered" dealing with some 20 tones of limestone. Lots more to do tomorrow!. The signal has been prepared from the equipment donated from the Bletchley Model Railway Club who were evicted from their premises at Bletchley Park as that project reorganised. We are not sure where the signal post originated from but it does add a certain grace to our enterprise. Back at base the LCC was in action including a Hoover up in the Booking Hall and her loyal assistants, husband and son, continued with the refurbishment of the waiting shelter on Platforms 2 & 3. A two man dmu team restored the gearbox to 50170 reporting much satisfactory progress and the Pullman Buffet Car had a modest day but served a few visitors from the USA who were also encouraged to by a products from the Booking Hall. The Booking Hall continued to deal with Amazon enquires for lunches and teas together with today's passing trade. Quite a busy day that was mostly sunny but developed into rain this afternoon. Our main thrust today was an extremely busy service necessitating three cars for the 1115 Duffield to Wirksworth to accommodate a coach company booking and a group from Derbyshire Sight Support. The team mobilised to ensure all our passengers were made welcome and enjoyed the delights of the EVRA shop and Model Railway. These passengers were swelled by a goodly number of visitors to Wirksworth station and there was a happy atmosphere as the station platforms filled up. The Pullman Buffet Car catered for Derbyshire Sight Support who lunched with us and their Afternoon Tea customers together with our passengers and visitors to good effect. 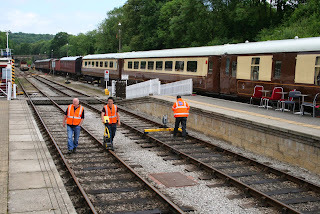 Down at Duffield the team there grouped to pull weeds on the main line platform in between our own services and there was further tidying and weed treatment in the station area. The dmu team participated in much shunting and removing a defective gearbox form 50170. 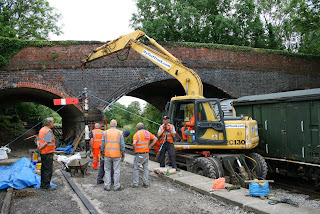 The PWT dealt with a dropped joint south of Wash Green which required digging out contaminated ballast, jacking and packing and reballasting to hold the track in place. The team also assembled a train of some length ready to depart for Shottle in the morning with all the requisite materials for a major purge there. 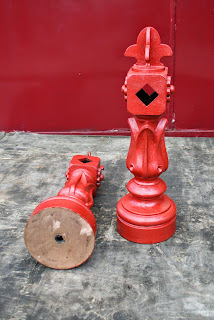 The DST reported that they have started reassembling Cathryn and treating the paintwork on Henry Ellison following the fitting a steam carriage warming to the locomotive. 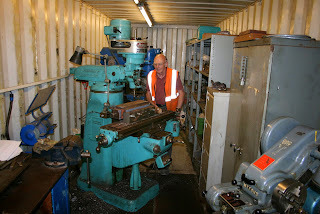 One of our photos shows another unsung hero in the shape of Stuart Barton who controls our machine shop and is working away at the horn guides for Cathryn. Stuart has many demands on his time machining parts for locos, coaches and dmus on the equipment very kindly donated by Rolls Royce. The other photo shows the work being undertaken by the LMSCA on their BTO. 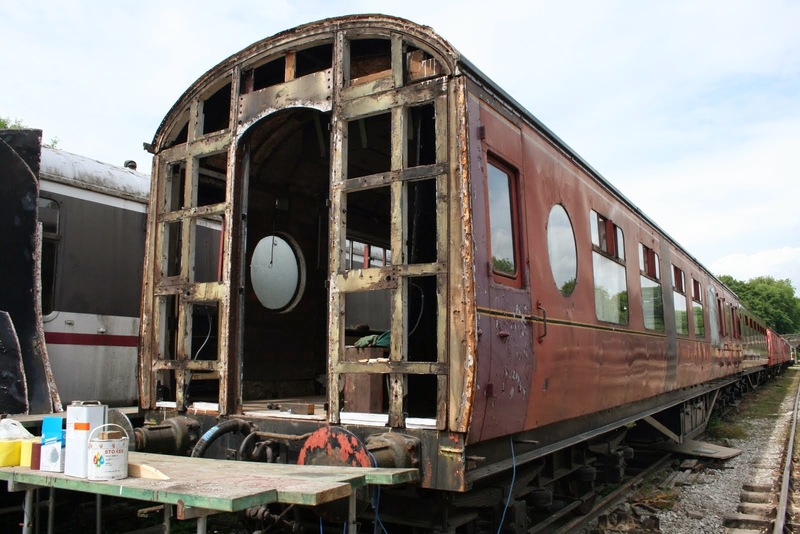 I was told that the vehicle was originally intended as a support coach fro 71000 Duke of Gloucester but that project ceased after wooden framed coaches were banned from the main line. The coach end was replaced but the modification was not water tight hence the remedial work being undertaken. The SBT completed the installation of the platform drainage channel following the purchase of more material from Twiggs as they prepare themselves for the next two days of intense activity to fill the platform ready for tarmacing. Freda & Iris gladdened the heart as they tended to the Mess Hall and Wirksworth's station flower displays. Richard P continued his war on any weed emerging in the wrong place within the Wirksworth complex. The Booking Halls were in go mode to serve today's passengers and I can report that the coffers filled after a most satisfactory day. PS - anyone who can help at Shottle will be made most welcome - please bring a rake with you! Monday is normally our quietest day of the week but it was enlivened by a prearranged coach group who were royally entertained by our train crew and fed by our catering team. As this was the first visit by this holiday company we were anxious to demonstrate how a visit to us was a complete package. My thanks go to Eric Boultbee, John Evans and Nathan Cooke who entertained the visitors and the catering team that provided lunch before departure and tea & biscuits when they returned. John deserves special thanks for performing the guard role three days running and is back again tomorrow for more enjoyment! The coach is illustrated as we were the main destination for this day out and the customers seemed very taken with what we had to offer. Three cheers to all involved. The VCT decided to remain at Wirksworth today in view of the charter but diligently valeted their Landrover and found a trove of undiscovered, forgotten, treasures in their container whilst repairing the leaking roof. Mike Billings continued to fettle the flail attachment for the Komatsu so that we can start again to deal with sight lines at all our farm and footpath crossings. The Booking Hall welcomed today's guests and the Pullman Buffet Car achieved great praise for their attention to our customers. The second photo today is of some mystery objects discovered during a recent British Transport Police exercise hidden by undergrowth alongside Bournebrook Avenue at Wirksworth. Vince Morris kindly cleaned and painted them discovering that they are probably bronze. I am open to offers for these rather splendid finds and would be interested in any clues to their provenance. Today provided the culmination of a deeply pleasant weekend of diesel boggling, up and down the valley. The weather was delightful, the pace leisurely but on time and the passengers happy. After a morning of ritual carriage window cleaning we despatched an evenly loaded first service and this continued for the rest of the day. The picture attached shows yesterday's activity at Duffield. The Duty Conscript was presented with a pair of loppers and the school path to sort out, and this has improved it no end. The Theme of Prunes, as opposed to the Game of Thornes, also continued at Duffield. There was no report from the shed today as the DMU Team have been attending the Llangollen DMU Mardi Gras and Pride in the Valley event. going on a short refreshing walk of a mere several miles to the Middleton Top Sheep Wash Festival. Progress continued to rectify the Air Con of the Pullman set and now that working class has been successfully dealt with, upper class will be addressed in more detail tomorrow. JCB Purves had a dedicated afternoon of total painting, managing to use almost the entire contents of the paint store normally kept for Painting Emergencies in the back of the Passenger Department Clio. 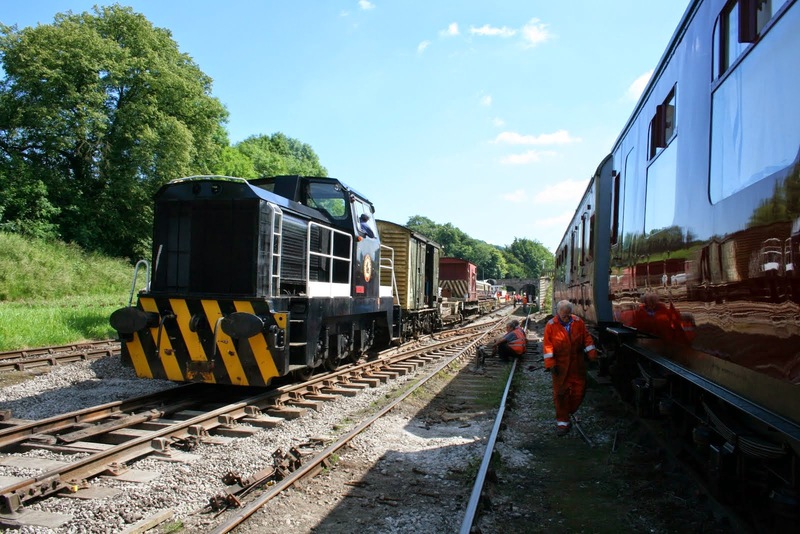 What a glorious day here at the gem of the Peak District and an excellent start to our diesel locomotive hauled weekend with very satisfactory visitor numbers. The narrow gauge and model railways were open and proved popular with our younger visitors. Down the yard worked continued on Iris with her dome being painted and 50253's TPWS had further attention. The 8F group and Oakes Enterprises worked on the Duke's frame and the booking office was kept busy dealing with a number of Station Master Luncheon and Driver Apprentice bookings. The Pullman Buffet dealt with a continuous stream of customers throughout the day. Todays photographs are of a group of enthusiasts from the Grantham Railway Society admiring the restoration skills of Tim Oakes et al and the Class 31 looking rather resplendent in the early morning Wirksworth sun. A very pleasant warm sunny day in which we pottered around with our steam experience guests and various other visitors brought out by the sunny weather. The main thrust of the day was carriages and the LMSCA exercised their parts around the site as well as making final readiness checks to their SK and BSK for the Diesel Weekend tomorrow and Sunday. dealt with event related preparations for the weekend, as well as tidying up Ravenstor after yesterdays all night international rave, which appears to have involved tearing up a couple of school books and having a cup of tea. The youth of today. At least they don't carve their names in our seats with a penknife like their raving granddads did. is now an island of chill in a sea of humidity. staff at Duffield weeded their way around the site so that our fine pair of diesels can be seen in their full glory. Through the good offices of Tom's scan we can all now glow with pride! Just seen today's Matlock Mercury in the reading rooms of The Malt Shovel. There is a two page spread by a reporter who, unbeknown to us, sampled the first day of the Station Master's VIP Luncheon. It is extremely uplifting and reflects great credit on the whole Railway and in particular the catering team. I have tried to locate it electronically without success but no doubt somebody out there will be able to do it! Today's photo shows the glamorous side of heritage railways - drains. The PWT and the ever useful Komatsu exposed and graded the bank adjacent to our neighbour on the Hannages as part of our efforts to reduce his flood risk. A rather futile gesture as the neighbour has rather a lot of work to resolve his part of the problem but it is now done although there is rather a lot of muck to be shifted at some time in the future. Our customer had day two of the course for their customers and seemed content with our part in their studies. The dmu team became multi purpose today as they supervised the fuelling of the Class 31 and positioned it on the loco hauled coaches ready for Saturday. Mike Jacob reassembled the sanders on the Class 33 which had been removed to facilitate its loading after journeying to the Keighley & Worth Valley Railway and Mike Evans had a purge on roof leaks on 50599, 51188 and 59303. The team also berthed their fleet out of the way for tomorrow's steam experience day and the upcoming diesel weekend together with preparing the trailer car for the Ravenstor services. 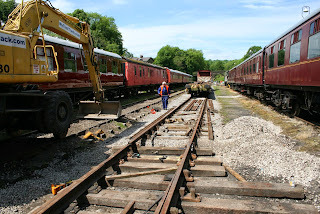 Down at Duffield there was some weeding and pruning to prevent paint damage during the loco hauled run rounds. Michael Perkins and Callum serviced the loco hauled stock ensuring the toilet tanks were topped up so, again, we are ready for the weekend. The Booking Hall dealt with the ever growing administration of forward bookings and the Pullman Buffet Car looked after our customers for lunch and visitors that required a little refreshment. Another day of great activity with two customers on site with their hand held devices. The first photo shows a meet between the two where cordial relations were established. John Evans managed the annual examination and servicing of our large fleet of fire extinguishers and I am most grateful for his help to minimise the financial impact of this exercise. The PWT completed the through track on Road 2 as part of the new crossover installation and the second photo shows LJB proving that the new iron work is safe to operate over. This marks the culmination of a great deal of effort before departing for tasks at Shottle. This project will be returned to after some missing parts are sourced to complete the lead from Road 2 to Road 1 is achieved. A lone PWT member hand sprayed weed killer around Wirksworth Yard and my thanks go to Richard and Tony for really getting on top of the weed treatment of the whole line this year. The LMSCA continued with the removal of roof vents on their BTO to enable them to be plated over to prevent water ingress. 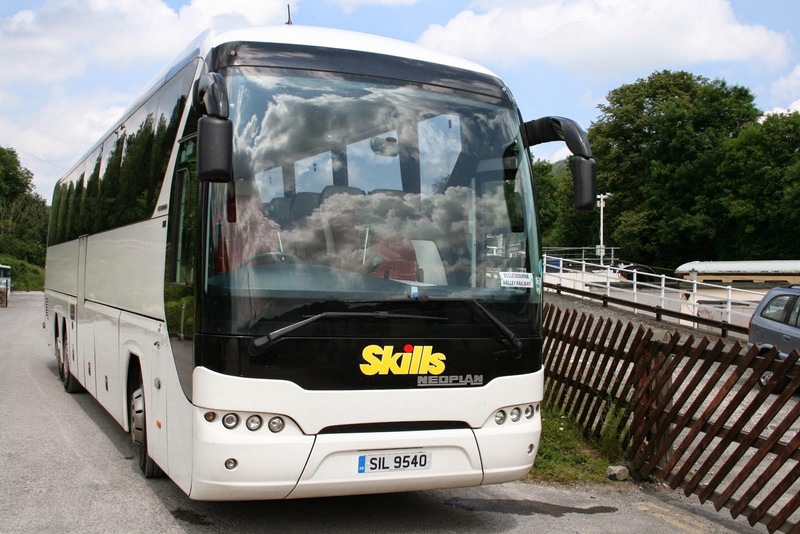 The vents will be replaced to provide a cosmetic appearance whilst the coach will be water tight. At Duffield the grass was cut and weeding took place which was matched at Shottle with a further 15 metres of platform drainage completed leaving around 12 metres to be achieved. There will be a wholesale move of the PWT to Shottle next week to place the necessary fill in the platform before tarmacing can commence. The SBT would welcome all hands Tuesday to Thursday and have a special request for attendees to bring rakes with them if possible. The locomotive hauled coach set was moved to Platform 1 at Wirksworth for the attentions of the LCC prior to this weekend and we welcomed two visitors from the East Kent Railway. The Pullman Buffet Car provided lunch for our customers and served Dave's Walkers together with a number of visitors brought out by the afternoon sun. Today's photo is from the past when the platform was constructed to accommodate the Museum Coach and the team involved including the late renowned Vince the Elder. 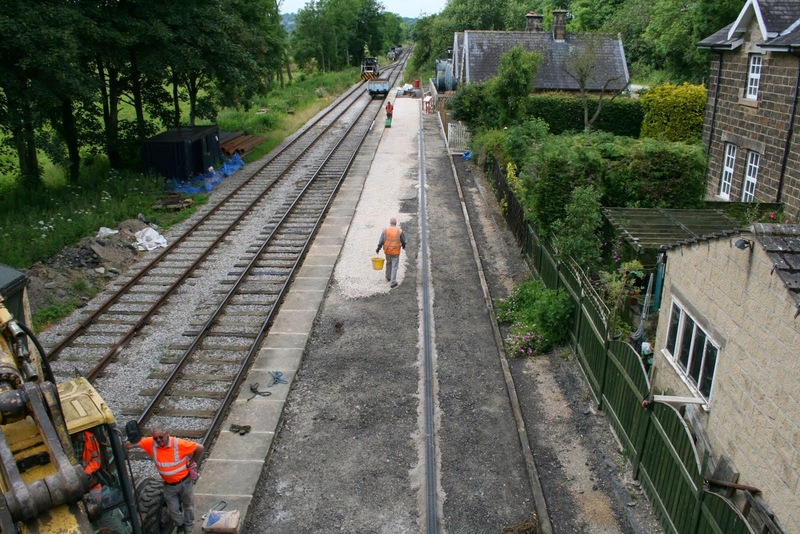 The day included Fred and Iris giving the Mess Hall their customary deep clean and the PWT continued their endeavours to restore Road 2 in the area of the new crossover. We had a most successful service day that nearly overwhelmed our two car set where crush commuting was replicated on one journey with a spectacular 167 passengers. The service was supported by the EVRA shop and Model Railway with thanks to those involved. The DST prepared No3 for Friday's experience day and continued with Cathryn reporting much painting, welding and drilling. The LMSCA fitted the southern gangway connection to the TO and progressed the interior ceiling of the vehicle. We said goodbye to one of their team who is returning to his roots in Wimbourne, Dorset and he departed with all our good wishes. The BTO of the LMSCA fleet began to have attention to its roof and the dmu team washed both their two car sets. Track patrols were out and about yesterday and today fitted in between our ever busier schedule. Attention was given to the air conditioning in the Pullman First and Second Opens just when we thought that this may not be possible due to the age of the vehicles and the gases involved. The Pullman Buffet Car was tested by some 28 Afternoon Tea customers together with a group of 26 having a light lunch but, needless to say, they delivered all that was required with great style. The Booking Halls served all today's customers with a most satisfactory result for the bank. The day was dull and a little chilly but provided all our visitors with a pleasant day out. A curiously damp Father's Day saw us quite busy with passengers and lunch guests as well as people discovering us on their holidays. The main activity of the day was around the shed with railcar 50253's restoration tearing along, including trim, pelmets, various sanding, painting, box fitting and examinations taking place. An electrical investigation of the catering set's air con also took place following its lunch turn. The Purves Jenkins Massive endeavoured to bring the overgrown hedge on the school path under control and the number of cars bouncing along the car park was much reduced indicating recent successes in the filling of potholes. Tom Tait forwarded a Trip Advisor comment on our Afternoon Tea experience and it can't get much better than this. It reflects extremely well on the whole team but particularly the Catering section where I know it was Angela's first excursion into scone making - I feel a TV series coming on. "Visited June 2014 with elderly mother. Bought a special deal on Amazon and enjoyed unlimited travel and afternoon tea - which would all be great value even at the usual price. Thoroughly enjoyed chugging along (in heritage diesel trains) at a speed which allowed us to view the scenery. Spent a short time on the platform at Duffield station watching the mainline trains passing through, a pleasant leg stretch on a lovely sunny day. Sat behind the driver on return journey along with the train buffs. The driver answered all their questions, which I am sure made their day, and added to ours. Back in Wirksworth we caught the train for a five minutes ride to the end of the line at Ravenstor where we had a few minutes walk on the platform with staff giving us the history of the line and pointing out items of interest, before the short ride back again. Time for tea! What a tea... First Class dining car with linen tablecloths, napkins and china. Dainty sandwiches with very tasty and unique fillings. Best scones we have ever tasted, with plenty of strawberry jam and clotted cream - apparently this was the cook's first batch of scones and she was complimented by all the diners! Amazing assortment of dainty cakes and pastries - which we did not have the space to try - but like everybody else we took a "doggie bag" to enjoy later. The waitresses were suitably dressed, very attentive and genuinely enjoyed their job. Our day was enhanced by the lovely weather but the Railway Staff were also very helpful to my mother and obviously enjoy their work and interacting with the public. The site is not entirely suitable for those in wheelchairs, (unless you can also walk a few strides with assistance for boarding trains, or the toilet) but this is a heritage site and efforts have been made within those limitations. However for those walking with sticks everything was accessible and the Staff quick to help with boarding trains etc. 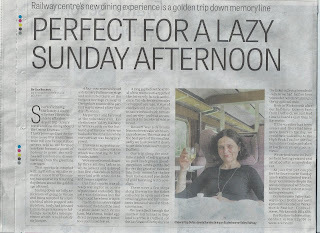 The whole day was very relaxing and enjoyable and would be a dream day out for a train mad family - especially if you book Afternoon Tea (Tuesdays) as part of your visit. Have recommended to everybody we know!!" 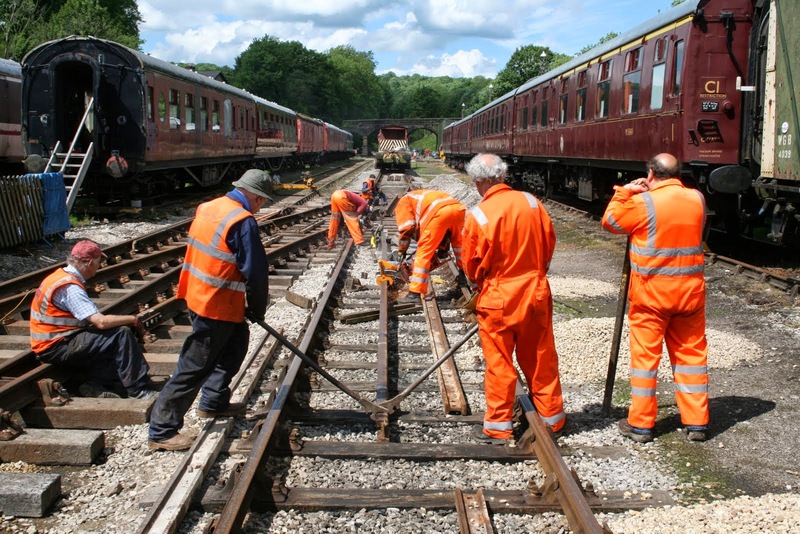 Today we had a steady productive day on our railway. The trains wended their way through our very scenic route to Duffield and Ravenstor, passenger numbers held steady but maybe we would have had more except for those football games in Brazil. On the productivity scene the DMU Team managed to start the engine on 50253 and it had its first run in anger on No 1 Road to Wash Green,also we repaired an oil leak on 51370 and prepared the gearbox for removal from 50170. Other tasks were as follows Dan continued with the roof painting on the 8F coach. The LMSCA fitted insulation to the bodyside of the LMS TO and fitted the ceiling supports on this vehicle/also preparation was made by Derek to the BSK in readiness for next weekend loco hauled weekend. On the infrastructure side new chicken wire was fitted to the North End Crossing walkway as an anti slip measure for people passing from Platform 1 to 2. Anton was seen to be moving what looked like wooden gateposts before going to Shottle with the strimmer to tend to the vegetation. The Class 31 had a check over and the electric were looked at on the Pullman Buffet. The Model Railway was in operation and the Book Shop generated interest from our passengers. their carriage ceiling in the TO, fitting mirrors and painting compartment grills in the SK and painting the roof of the 8F group support coach. Around the station we had another day of potholing and mowing. The sun beamed down and it was a warm and delightful day which allowed much progress on many fronts. The M1M completed repairs to a broken window on their CK and reported that rewiring of the SO was now complete. The dmu team rearranged the stock to permit tomorrow's steam experience to enjoy unfettered access to Gorsey Bank and Ravenstor. They then prepared 50170 for the removal and replacement of a gearbox. Duffield Main Line benefitted from our attentions with a novel approach to the southern end of the site to create a "Mediterranean" feel to the platform. 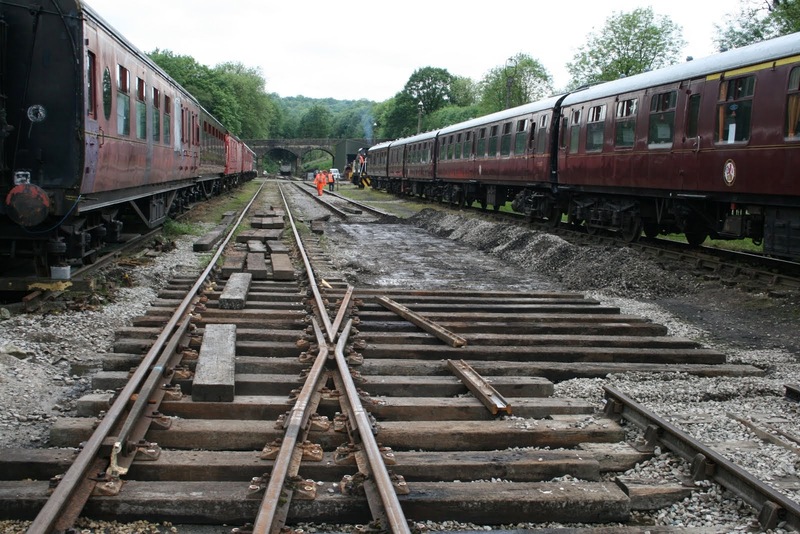 Our customer entered the second day of training at Wirksworth and the PWT continued to restore Road 2 in the area of the new crossover with the objective that it will reopen in time for next week's diesel weekend. The Pullman Buffet Car again hosted lunch for our customer and benefitted from a number of visitors encouraged to visit by the pleasant weather. The Booking Hall enjoyed more Amazon bookings for the Driver's Apprentice product together with another online steam experience booking. Today's photo shows Richard mastering the placement of a replacement rail and how the crossover project is coming together. Mick Thomas and I met with a neighbour on the Hannages at Wirksworth that had experienced severe flooding during a downpour two weeks ago. Our debate was aided by two representatives from Derbyshire County Council new flood planning department. All sides liabilities were discussed together with responsibilities and a way forward was agreed with all sides parting in good humour. 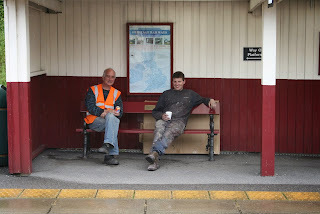 All part of the joys of running an heritage railway! It was good to welcome back one of our regular customers who is undertaking a two training course for their customers. They are illustrated demonstrating the computer based measurement kit. The customer together with Relate, who were holding a team meeting, both enjoyed lunch in the Pullman and Richard Preedy was on a mission to deal with weeds at Idridgehay and on Shottle platform as part of the preparation for the fill needed to bring the structure up to height. The SBT completed the patio project which the area underneath the canopy and benefited from a further 20 tonnes of donated fill which all goes to reduce the final price of this project. We have set a date of 9th August for opening the finished product and the team there would welcome extra, fit, pairs of hands over the next Tuesdays and Wednesdays to speed them on to the end product. 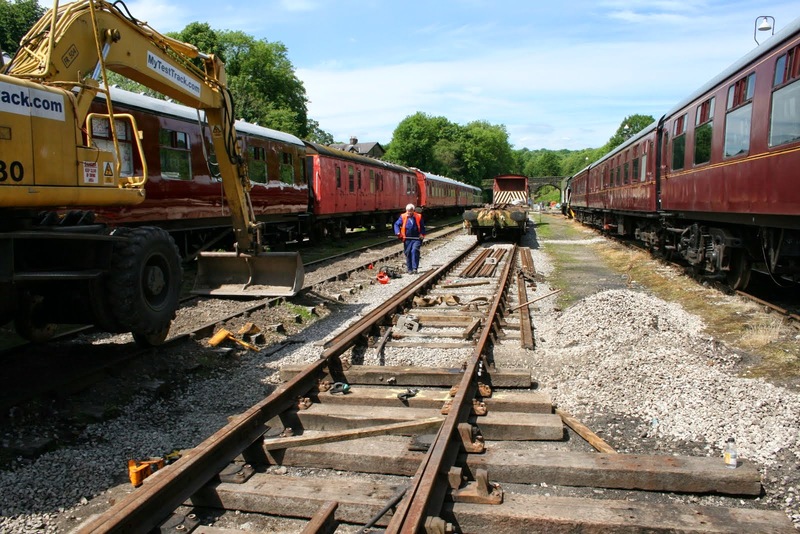 The PWT continued work on the crossover at Wirksworth with substantial progress being made and the LCC tackled the 2 Car set together with the Bubble Car that are the present mainstays of our passenger services. She also turned her attention together with Derek Mason to the BSK and SK of the loco hauled set as we approach the diesel locomotive weekend. A lone dmu worker reported a lack of progress today but claimed it was compensated by the fitting of lino in the cab of 50253 yesterday. Cooke Enterprises made substantial inroads into the refurbishment of the waiting shelter on Platforms 2 and 3. The Duffield contingent gave the facilities a thorough clean and tended to the plants and flowers there. Thus the Pullman Buffet Car had a most satisfactory day with much praise from their party bookings and the Booking Hall enjoyed further on line sales. The weather was fine and we had a most satisfactory day. Today's photos show a part of our enterprise rarely featured and the PWT continuing with the installation of the newly located crossover. 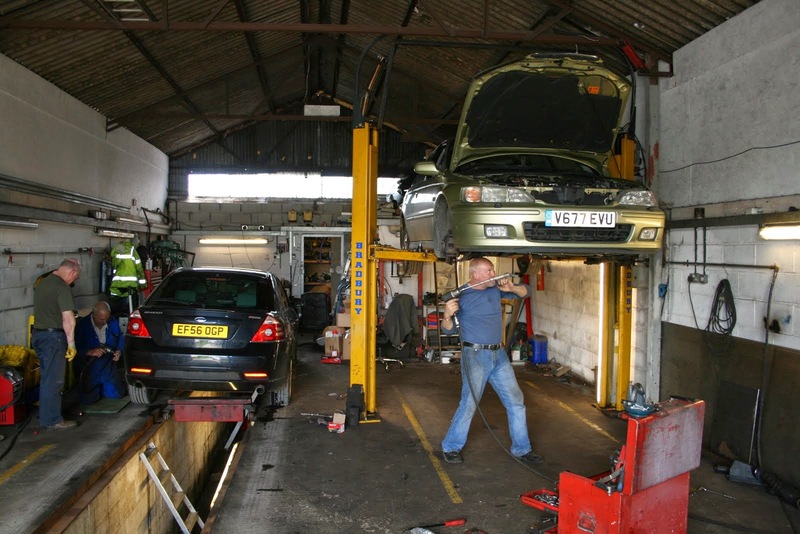 The Station Garage are our tenants providing a useful income to the Railway and are to be commended for their service and relatively economical rates. 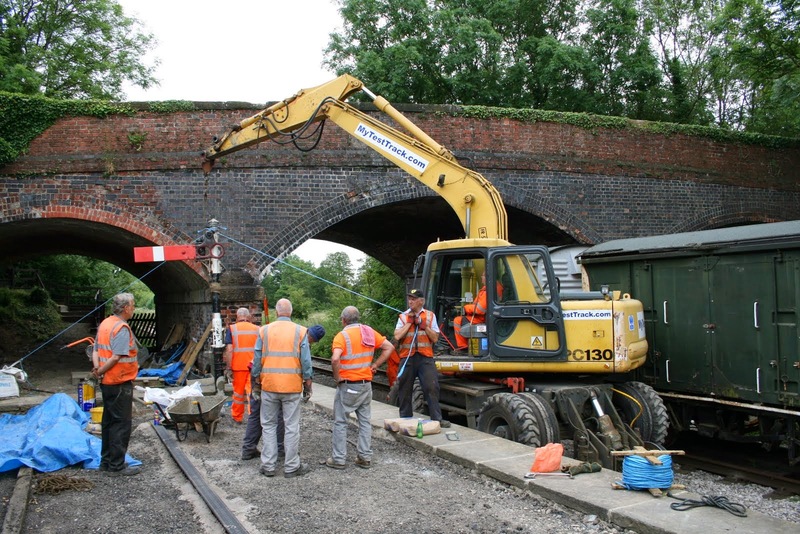 The second photo shows rail cutting for the crossover installation where measurements have to be precise when you consider each 60ft length of rail now costs some £420 and a wasted cut can be quite expensive! Fred & Iris returned to the challenge of a Mess Hall after 7 days of activity although Doug Futter had spend some considerable time washing up the pots from the weekend this morning demonstrating that some of our team have no shame or consideration for the welfare of their colleagues! Our service today was extremely well supported with Driver Beale being challenged by the operation of both the Ravenstor and Duffield services. 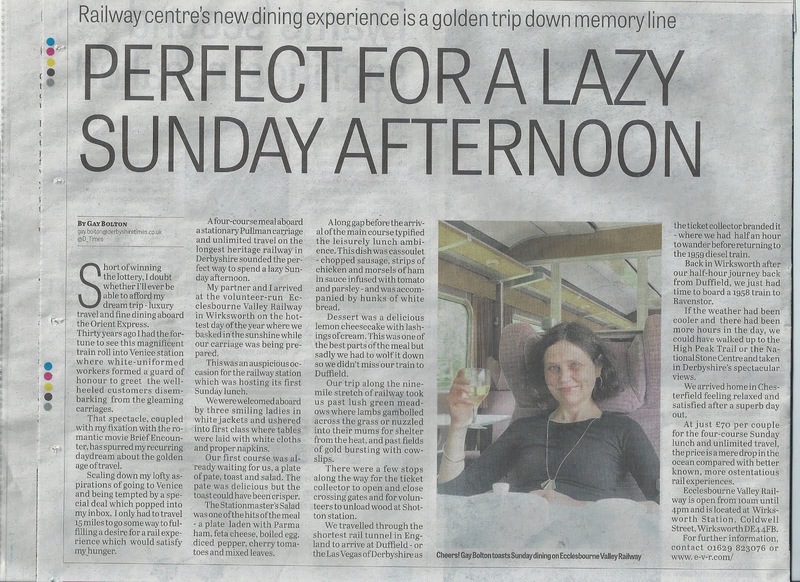 The service was supported by the EVRA shop and Pullman Buffet Car that also had the Tuesday quota of Afternoon Tea reservations. All participants seem to have a most rewarding experience. The dmu team of one concentrated on L J Breeze to try and ensure its continued availability in advance of more serious surgery to one of its injectors. 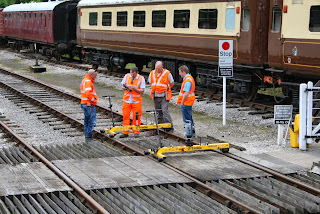 A new firm from Ashbourne experimented with a new form of Road/Rail Access Point receiving helpful advice and guidance from our Road/Rail operator. 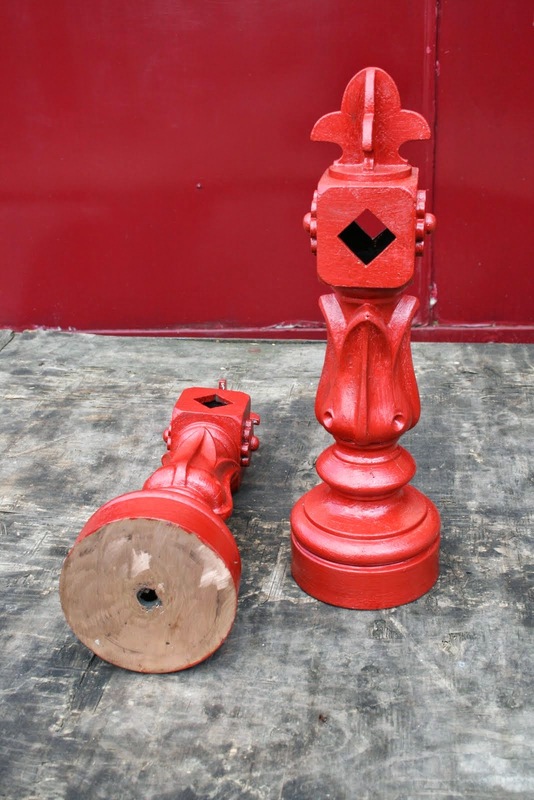 The DST started the long process of reassembling Cathryn following Stuart's machining of horn guides. The driver experience locomotives were cleaned and tests were made of using a pressure washer for this purpose. The 8F's TSO received paint to its recently prepared roof and the LMSCA concentrated on their TO fitting roof hops and side rails. This will allow a new ceiling to be fitted in the fullness of time. The M1M tended to the replacement of a damaged toilet window and new wiring in their SK. The Booking Halls at Wirksworth and Duffield had a most productive day with Wirksworth dealing with luncheon bookings and a Drive a Diesel Day. A satisfactory banking was the product of all this activity. A rather pleasant sunny day with a short rainy moment during the afternoon. We entertained a reasonable number of passengers and lunch guests as well as a "Driver's Apprentice", which is rather like a sorcerers apprentice but without the music and pink elephants. frames from 50253, as well as giving unit 50170 its routine examination. Back at the station some further gravelling went on around the Clochemerles, the wideway got a mowing, the station approach got some more potholes filled and the Marks and Spencer Synchronised Singing Team fixed some gates and other structures. The Duty Conscript was given some fence painting along platform 1 and this can best be admired from the back. Hi Guys - The early morning downpour certainly kept the punters away but The Saab Rally saved the Day. Some groups worked inside.The DMU Team continued with the Lining on Iris, roof painting on 50253 and 50170s C exam after erecting temporary storm shelter. 55006 even manged half a body wash. The Pullman Buffet worked to full capacity with Saab rally. A lovely summer day, sunny, warm and pleasant. We entertained a number of steam Driver Experience guests and the sun brought out assorted visitors to the buffet and the station. roofs and around the class 31, which is now ready to receive its down side decals. 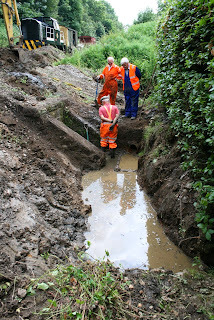 General engineering and restoration work also took place courtesy of the LMSCA and an escapee from Marks and Spencer. Back at the station, the foremen have begun to strip the platform waiting shelter ready for its own major repaint, this is likely to take several weeks but will be much improved once completed. The dmu team feature today with Iris looking resplendent and 50253 rapidly coming together as illustrated. The team also completed a "C" exam on 50170 to ensure our fleet is in tip top condition. The PWT concentrated on the positioning of the iron work for the crossover on line 2 with a slightly larger team than yesterday. The M1M continued with their endeavours on the Second Open and life was generally more peaceful than the last couple of days. The Pullman Buffet Car looked after today's visitors to Wirksworth Station and the Booking Hall processed two more bronze drive a diesel days together with a raft of lunch and tea bookings. A wet and miserable day that held much for our enterprise with the presence on site of a large team of British Transport Police and a most delightful test customer from Northern Ireland. 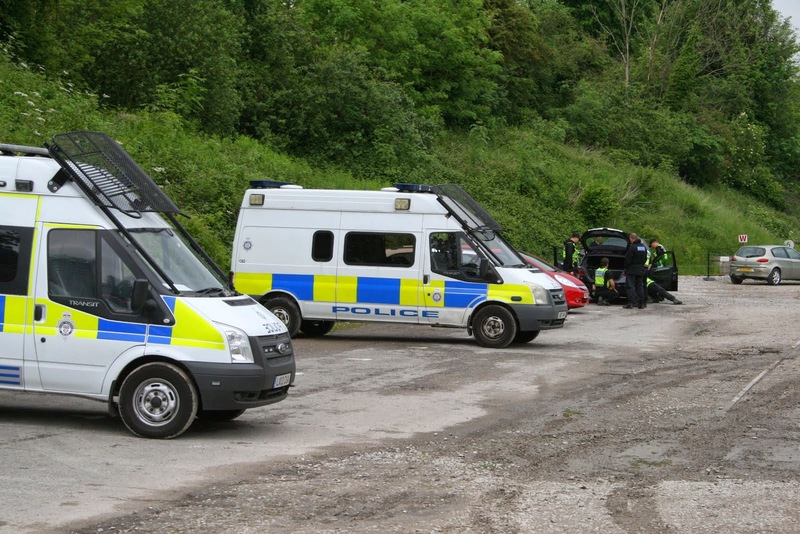 The Police completed their two day exercise leaving with much praise for the ability to freely conduct their exercise and enjoy the delights of the Pullman's bacon butties. The customer was equally pleased that their considerable investment resulted in an approval for their trailer by Atkins and Network Rail equally appreciating they could refuel in the Buffet. The machine ensemble is pictured together with the hard working LMSCA team who had been reconfiguring their SK to seat 64 passengers rather than 48 by devising and fitting a four a side seat numbering system. 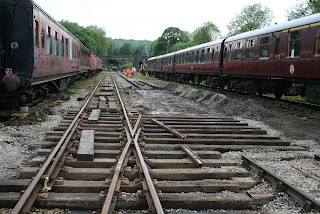 The very small PWT, some 2 and one half people, managed to lay out 28 crossing timbers for the Road 2 pointwork in addition to patrolling the Ravenstor line. Not a bad achievement at all! The bogies of Iris have been degreased ready for painting and reassembly of the first class area in 50253 commenced. The Pullman Buffet Car enjoyed a busy day and the Booking Hall managed to stay sane as the never ceasing phone rang with Tea and Luncheon bookings. All in all a most productive day that ended with a further three days testing booked in. PS It has been pointed out that Allison was not sowing but sewing yesterday! Today was enlivened by a very strong Police presence as British Transport Police commenced a two day exercise which caused some frissons of excitement amongst our ladies of the Buffet - nothing like a uniform! The service today enjoyed a very high patronage including a, first of what may be many, coach group from the Portsmouth/Southampton area who were made most welcome and enjoyed the rest of the day in Matlock Bath and the Tramway Village. The nice touch at Crich was they were fielding Southampton 45 which was the very first tram in preservation and started the whole historical tramway movement that ended up in Crich during 1959. It was also good to see "Essex Pete" looking very smart and leading a party that enjoyed Afternoon Tea in the First Open Pullman. The PWT started the preparation work for Road 2's contribution to the new crossover installation and arranged the Track Patrols that embraced the whole line from Duffield to Wirksworth leaving the Incline for another day. The DST prepared Henry Ellison for Friday's steam experience day and work plodded on steadily with Cathryn. The PWT also re-arranged the rolling stock that will permit tomorrow's test to work seamlessly. The LMSCA concentrated on cutting timber for the interior of their Third Open, Allison continued with her sowing of the corridor connection bellows together with initial preparation for their fitting at the corridor end,.The Yard had further hand spraying and Fred & Iris gave the Mess Hall their usual treatment. The 8F's TSO (Tourist Second Open) roof had further treatment prior to painting and the M1M tended to the ceiling of their SO (Second Open). The Pullman Buffet Car not only dealt with today's Afternoon Teas and today's passengers but dealt with the healthy appetites of our Police visitors. The Booking Hall were exhausted by selling tickets for today's trains but the unrelenting, and pleasurable, demand for Teas and Lunches plus another couple of Bronze Steam Experience bookings. The photos are self explanatory and I am pleased the VCT accomplished their whole line survey of necessary tasks yesterday and have decided to concentrate their efforts to Mondays for the foreseeable future. A wonderful warm sunny day here in the Peak. We pottered around with passengers and Pullman guests, and the station looked busy with people sat around watching the trains go by. carriage floor, and this vehicle is now setting the standard which we would hope to achieve in all our hauled stock. 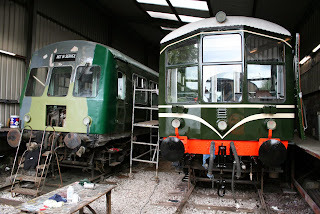 Nearby a vast amount of painting took place on both mainline locomotives, in the case of the 31 in Locomotive Green and in the case of the 33 in Rail Blue. Painting also took place on the solebar of Iris the Railcar and her new paint job is very wonderful to behold. 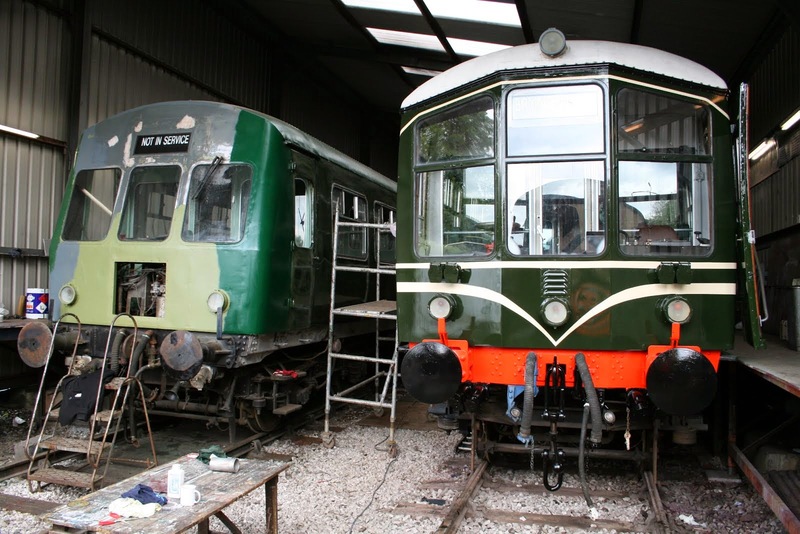 The DMU team occupied themselves with wide ranging tasks from valve replacements to 55006, to work on 50253's blinds, doors, door backs and droplights. efficient working of that fine hand-crafted machinery. Stokes Enterprises accompanied the mowing with some work on the station mobile phone network.